When talk of tunneling under downtown Nashville first surfaced last fall, many wondered if it could be done. After all, common wisdom had it that Nashville is built on limestone, so subways are out of the question. Not so. Tunnels can and have been dug through limestone, and what is being proposed for Nashville is in keeping with what has been done in other places. The plan for Nashville is to run two 20-foot-diameter tunnels side by side down 5th Avenue from near Charlotte on the north to near the Music City Center on the south. Each tube would accommodate trains and electric buses in one direction. Larger spaces would be mined out underground to accommodate a station. The tunnel would go directly under 5th Avenue but wouldn’t go directly under the existing Music City Central transit building between 4th and 5th and Charlotte, explains Jim Czarnecky, associate vice president of HDR, the engineering firm that is working with Metro on the Let’s Move Nashville plan. “We will take great care not to disturb any of the existing infrastructure and buildings, and the intent is to keep all of the tunnel in the existing public right-of-way,” he adds. If a portion of any station needs to extend beyond the right of way, Metro may need to obtain property easements – permissions to use underground areas - from landowners, but shouldn’t have to acquire any property itself, he says. Moreover, the machinery used to create this type tunnel – a 20-foot transit-type tunnel boring machine – is a common type, Mooney adds. The machines can be built to specifications at a cost of perhaps $10-30 million, and sometimes a refurbished machine can be used. It takes about a year to get a TBM delivered to the site from a manufacturer. Mooney said the TBMs have a crew of 10-20 operators who operate and maintain the machine. The TBM excavates the ground, brings out the material that has been bored through and installs concrete rings at the tail of the machine as it inches through the ground, he continues. The cycle of excavation followed by concrete ring build work is done five feet at a time, and repeated until the tunnel is complete. The two tunnels would probably have to be at least 10 feet apart, or half the diameter of a tunnel. 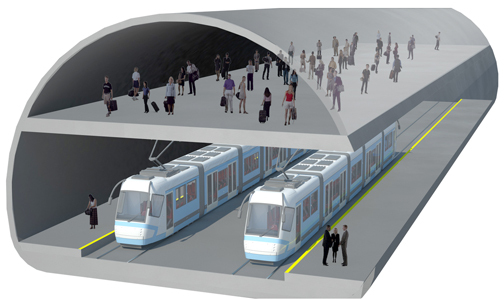 Once the tunnels are bored, emergency egress tunnels would have to be created to link the two tunnels so passengers could escape in case of emergency. Generally, the emergency egress tunnels are from 800 to 1,000 feet apart, he says. There are about five TBM manufacturers around the world, Mooney adds. Two are in North America – one in Ohio, one in Toronto – and both are owned by Chinese companies. Much of the world’s tunnel boring equipment is made in China.